We developed Autocloud as a part of Fedora 23 release cycle as a part of Two week atomic image. 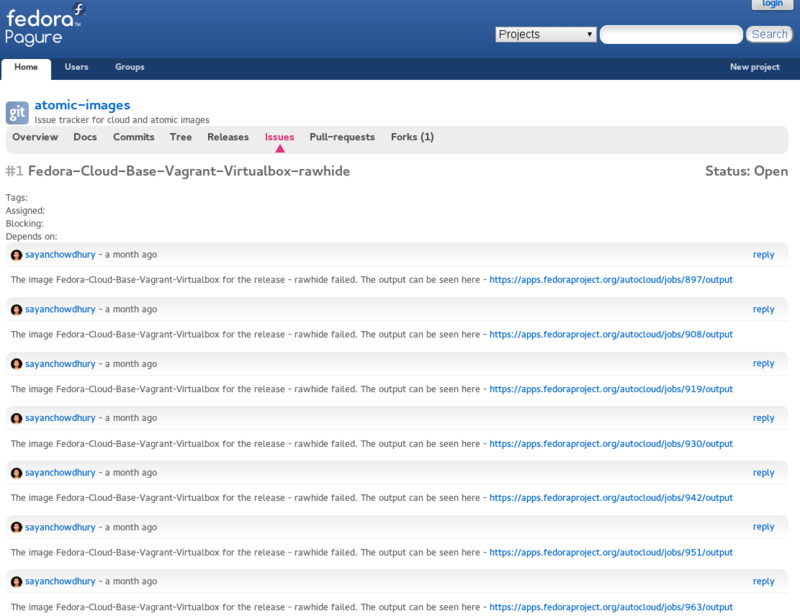 Autocloud publishes the messages to fedmsg when the image is queued, running, success and failed. Bugyou files issues for failed tests from Autocloud. Bugyou is part of Fedora Project. It listens to Autocloud messages from fedmsg and files bug for images which have failed the tests. Bugyou keeps updating the status of the images in the bug and closes the issue once the tests are successful. The plan is to make Bugyou more generic and to have plugins (Autocloud, Koji) and various issue tracking tools as services like Pagure, Github, Trac etc.